You can live days without water and weeks without food. Lack of oxygen, however, kills within minutes. Hemoglobin is the vital protein in your red blood cells that transports oxygen from your lungs to your tissues. A low hemoglobin level compromises oxygen delivery to your tissues. Many conditions and diseases can cause a low hemoglobin level, or anemia, including certain nutritional deficiencies. Supplements can help to raise a low hemoglobin level caused by a nutritional deficiency, but they will not correct anemia due to another underlying cause. Iron deficiency is the most common cause of anemia in the United States. You may develop an iron deficiency from inadequate nutritional intake, reduced intestinal absorption or blood loss. Microscopic examination of your blood and tests to measure your iron stores help your doctor determine whether you have a deficiency. Iron supplements and an iron-rich diet are standard treatments for mild to moderate iron-deficiency anemia. Your doctor may recommend a blood transfusion, iron shots or intravenous iron if you have a critically low hemoglobin level. Your hemoglobin level and red blood cell count may drop to abnormally low levels with a vitamin B-12 deficiency. Vitamin B-12 deficiency anemia is also known as pernicious anemia and megaloblastic anemia. Your diet may not contain enough vitamin B-12, especially if you follow a strict vegan nutrition plan. Poor absorption of vitamin B-12 can also cause megaloblastic anemia. Your doctor will request blood tests to determine if a B-12 deficiency is responsible for your anemia. Other tests may also be needed. Your doctor may prescribe vitamin B-12 shots, oral supplements, or both, to treat your condition and raise your hemoglobin to a normal level. Folate, or vitamin B-9, deficiency causes an anemia similar to that associated with vitamin B-12 deficiency. With both conditions, your hemoglobin falls to an abnormally low level and your red blood cells appear abnormally large under the microscope. Folate deficiency typically occurs because your diet does not include enough of this essential nutrient. Alcohol abuse, celiac disease and certain medications can also cause a folate deficiency. 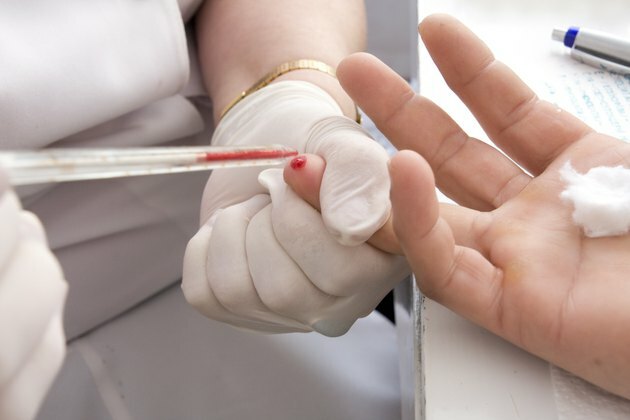 Blood tests help your doctor make the diagnosis of folate-deficiency anemia. Supplemental folic acid, the man-made form of folate, is the standard treatment for this condition. Vitamin B-6 deficiency causes an anemia similar to that associated with iron deficiency. In addition to a low hemoglobin level, vitamin B-6 deficiency causes impaired hemoglobin function. Anemia caused by a vitamin B-6 deficiency is rare in the United States. Your doctor may order a blood test to determine your vitamin B-6 level if more common causes of anemia have been ruled out. Supplemental vitamin B-6 is the standard treatment for this form of anemia. If you suspect you have anemia, see your doctor to determine the underlying cause of this potentially serious condition. The appropriate treatment for anemia depends on your diagnosis. A nutritional supplement will only correct the condition if it arose because of a deficiency. Talk with your doctor before taking any nutritional supplement to make sure it is safe and appropriate for you.